Sydney Shop Girl: The Weeknight Book Club: The Foremost Good Fortune by Susan Conley. The Weeknight Book Club: The Foremost Good Fortune by Susan Conley. Beijing is a city that fascinates me. It's contrasts of the old and the new, its size and its pace, the meeting of East and West and how all of this is filtered (for its citizens, visitors and the outside world) by the less than subtle censorship of the government. Susan Conley's memoir, 'The Foremost Good Fortune' takes us with her family as they relocate from Maine in the United States, to Beijing China. Susan's husband Tony has always had an affinity for China and Chinese culture and is not only fluent in Mandarin but has also managed to get 'inside' the heart and soul of the country and its people. It is Tony's job that takes Susan and their 2 young sons to a new life in Beijing. In the first part of the novel, Susan is desperately and at time humourously trying to stay afloat in a new country whose language she cannot speak and whose culture she cannot yet understand. Her 2 young sons begin school at an international school and through them, Susan begins to make friends with other expatriate families. The expatriate wives are bound by their foreign-ness and isolation in Beijing but this bond is not always strong enough to support friendships between them when personal difficulties and tragedies arise. Susan and Beijing are at first oil and water but slowly, after much shaking of both, they combine. Susan starts to learn Mandarin and befriends Rose, her young and talented Mandarin teacher. Susan's housekeeper becomes a much loved part of the family who loves Susan's sons as her own. The family driver helps them all navigate the streets and situations that Beijing presents them. Susan has a very natural writing style that manages to provide very powerful word pictures of the new sights and sounds that are part of her new home city as well as her own reflections of what all these mean to her. Just as the family get a toe hold in the city, a personal tragedy strikes. Susan is diagnosed with breast cancer and has a series of frustrating confrontations with the Chinese healthcare system. It is one of many situations where the friction is not Susan's alone. Beijing locals stand with her as together they try to get the truth and a fair hearing from those in positions of power and knowledge. Susan finally returns home to Maine for her successful treatment. It surprises her that she does return to Beijing with feelings of anticpation rather than dread. The novel ends with the family's final goodbye to Beijing. The friends they made, however, will forever be in their hearts and memories. 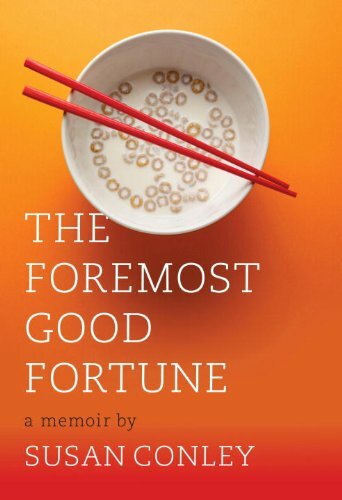 'The Foremost Good Fortune' is a memoir not only of family discovering and then belonging in a foreign country, it is also a very personal account of one woman's successful fight against breast cancer. As Susan becomes more proficient in Mandarin, her wider vocabulary not only enables her to be more easily understood by those around her, it also empowers her to articulate her needs, fears and emotions more succinctly. I was drawn in by the cover of this book in my blogroll but I have to say I'm impressed by your review. It's not obscured by the look-how-well-I-write syndrome that many book reviewers-- myself included-- are often guilty of. It's just very straightforward and engaging, clean writing. I may actually pick this up due to your words. I particularly liked your last paragraph. Thanks. It sounds like a wonderful book! I will try and kindle it!